Home GoRetro milestones It's personal GoRetro.Blogspot.com is Now GoRetro.com! 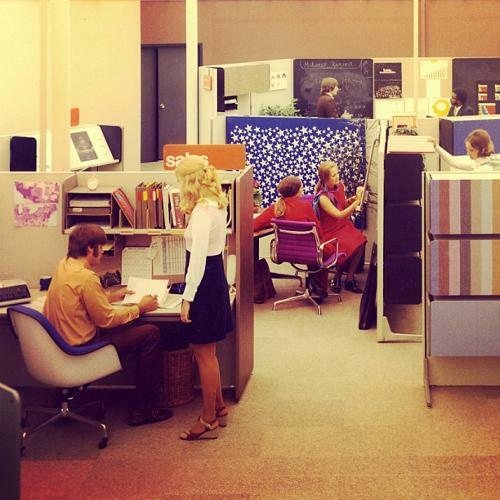 The Go Retro office, hard at work. Image via FastCodeDesign. Just in case any of you want to update a bookmark, goretro.blogspot.com now redirects to goretro.com. A few days ago I finally took the plunge and purchased the domain; something that's been in the back of my mind for a few years now. It wasn't cheap (the main reason I kept putting it off) but I see it as an investment. I've had this blog for about 8 years now (yikes) and I wanted to grab the web address before someone else did. In the coming months I'm going to be exploring redesign and hosting options and hopefully make the site more professional looking and begin pitching it to ad networks. But not to worry; the same groovy retro content you've come to know and love will still be here, still written by yours truly, and the design and posts will definitely NOT become women-oriented. Hey, Pam - You have been given an award on my blog today! Stop by and check it out when you can and congrats! Por moi? I'm touched, Cherdo, thank you! I'll check it out in a bit.